Apartment units facing the communial roof and Philadelphia skyline at Lincoln Square. Nearly two years after breaking ground at Broad Street and Washington Avenue, South Philadelphia's Lincoln Square project is officially open for business. Two new tenants, Chipotle and Insomnia Cookies, round out the project's impressive commercial lineup. 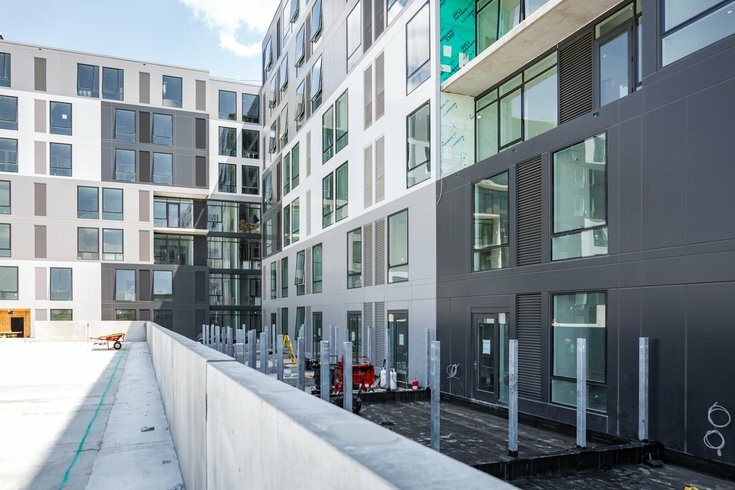 The $100 million, nine-story complex features more than 300 rental units and brings several exciting new additions to the neighborhood. Target and PetSmart were among the first confirmed tenants, followed by Starbucks and Sprout's Organic Market, which opens next week inside the site's historic rail shed. At a ribbon-cutting ceremony on Wednesday, project developers revealed that the Mexican fast-casual chain and popular cookie bakery would fill out the remaining spaces at the facility. Philadelphia Mayor Jim Kenney remarked on the history of the site and the rehabilitation of the rail shed, which the developers say briefly served as a stop on the funeral tour that followed Abraham Lincoln's assassination in 1865. For residents, Lincoln Square offers more than 50,000 square feet of amenity space, including a sprawling green roof with a lounge, fire pits, grills, a dog run and a track for runners. Chipotle fans in South Philadelphia will happy to have their first restaurant outside of Center City. It is also homegrown Insomnia Cookies' first storefront in South Philly. There was no immediate word on when the latest Lincoln Square tenants will officially open their doors to the public.